Berkhamsted town is a historic market town with a family environment. Its traditional High Street is bustling with both well-known brands and independent shops. Its great location provides easy links to London (direct trains 30 minutes from Euston) and Heathrow (40 minutes by car) making it easily accessible for both national and international families looking for a day or boarding school. Heatherton, our satellite Prep school in Amersham, is also directly linked to London with Chiltern Rail to London Marylebone or the Metropolitan Underground line. For our Senior and Sixth pupils, we offer our own network of coach services which stop at many of our local villages and towns making the School commute an easy one for many families. For a detailed list of routes please click here. The train station is easy walking distance from all our campuses, except for the Pre-Prep which is a relatively long uphill walk out of town and you may prefer to take a local taxi for the short journey. 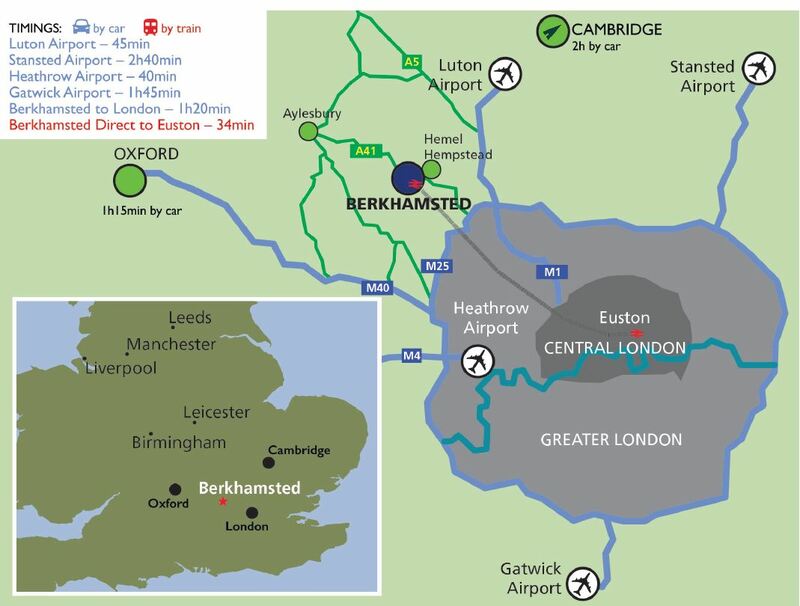 To find out more information on train times to Berkhamsted please click here. There is limited visitor parking at Berkhamsted Day Nursery, Pre-Prep and Prep, however, there is no on-site parking at our Senior Schools. We recommend using local public car parks, the closest being behind Tesco and Waitrose - both on the High Street. For more locations please see the map below. Amersham is a market town and civil parish within the Chiltern district in Buckinghamshire, England, in the Chiltern Hills, 27 miles northwest of central London. It is part of the London commuter belt. Heatherton is located within easy walking distance of Amersham station which allows for an easy commute to London by Chiltern Railways or the London Underground. There is no onsite parking. We therefore recommend using local streets or parking in the public car parks in town and walking the short distance to the School. Please note, that the turning behind our School is a private road (Heatherton Park) and should not be used under any circumstance.